The William & Mary Law School Institute of Special Education Advocacy is presenting a five-day training program in special education advocacy. Conference details including fees, registration, and agenda topics. Attendees will be selected via an application process. Applications will be considered on a rolling basis bi-monthly until the class is full. Early applications are recommended. Download the application for all registration details, costs, applicant questionnaire, and required pre-conference assignments. Hosted by the William & Mary School of Law and co-sponsored by the PELE Special Education Advocacy Clinic, Wrightslaw, and The Oklahoma Disability Law Center. 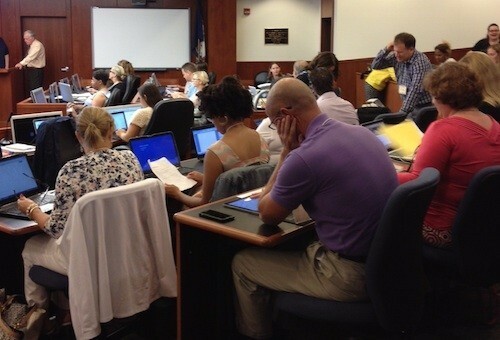 This entry was posted in Seminars & Training, Training and tagged ISEA, W & M Institute of Special Education Advocacy, Wrightslaw training by Wrightslaw. Bookmark the permalink. what are the requirements/qualifications for attending this workshop? lea: You’ve responded on a link to last year’s ISEA 2016. If you are interested in ISEA 2017, make sure you look at the current information. The Application link will provide information about requirements needed for consideration. Please take a look.